Odour eating essential oils in a cooling spray for effective natural protection. A pump-action spray made with refreshing tangy essential oils of lemon and sweet orange with a light summer scent to counteract unpleasant body odours without inhibiting the important fuctions of the skin. Free from aluminium salts. Weleda - Citrus deodorant is simple yet thoroughly effective formulations with odour eating essential oils incorporated into a cooling base. Weleda - Citrus deodorant is suitable for all the family. Citrus deodorant can be used on the feet to refresh and revitalise - especially good in the summer months. 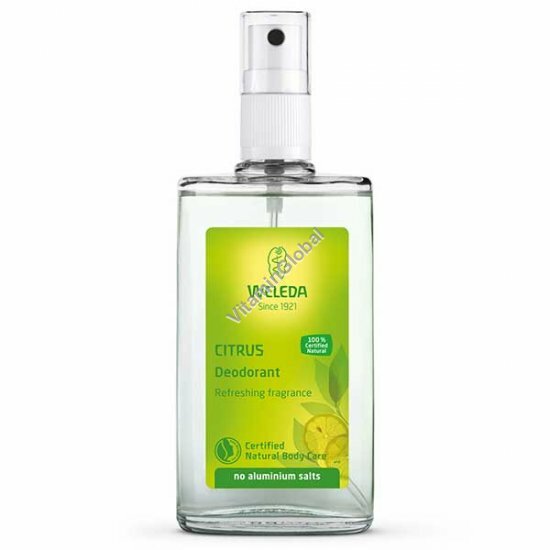 Weleda - Citrus deodorant can even be used to freshen the car or any room. Usage: Apply after showering or bathing as often as necessary. For most people one application lasts all day. Ve - suitable for vegans.